Looks like an iphone. 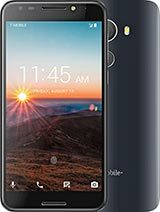 It's a good phone for the price. With 32gb sd card i can add lots of audobooks & plain text ebooks. I'd hoped it was on android but it's not (tesco did not know) - have since learned that the rapport & vivacity are. fm radio is excellent & you can record from it. the phones camera is 5mp, you can change from 3.2mp in the settings. This phone is made by huawei its the G7300. Total of 29 user reviews and opinions for T-Mobile Energy.